“Significantly, almost all Australians (95%) believe that ‘it is important for Aboriginal and Torres Strait Islander people to have a say in matters that affect them’ and 80% believe it is important to ‘undertake formal truth telling processes’, with 86% believing it is important to learn about past issues. Australians’ support for reconciliation and for a greater Aboriginal and Torres Strait Islander say in their own affairs continues to strengthen according to the latest national survey conducted by Reconciliation Australia. 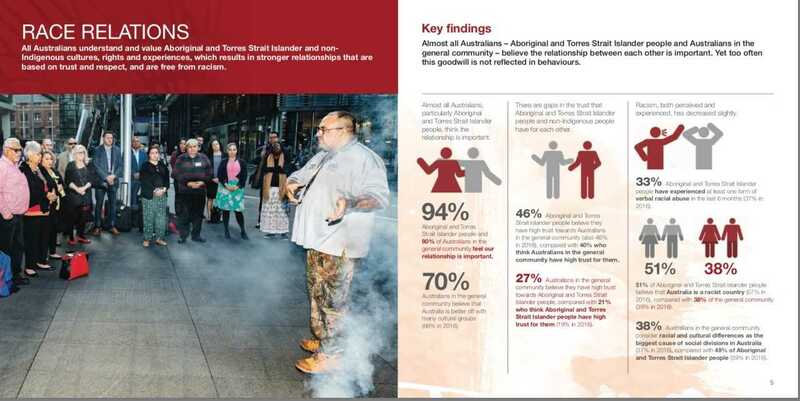 The 2018 Australian Reconciliation Barometer, a national research study conducted every two years to measure and compare attitudes and perceptions towards reconciliation, has found that an overwhelming number of Australians (90%) believe in the central tenet of reconciliation – that the relationship between Aboriginal and Torres Strait Islander people is important. The 2018 Barometer surveyed a national sample of 497 Aboriginal and Torres Strait Islander people and 1995 Australians in the general community across all states and territories. Reconciliation CEO, Karen Mundine, said that this latest Barometer once again showed a steady strengthening of the indicators for reconciliation and improved relationships between Aboriginal and Torres Strait Islander people and other Australians. “Among these indicators is the encouraging fact that 90% of Australians believe in the central tenet of our reconciliation efforts, that the relationship between Aboriginal and Torres Strait Islander people is important, and that 79% agree that Aboriginal and Torres Strait Islander cultures are important to Australia’s national identity,” said Ms Mundine. “More Australians than ever before feel a sense of pride for Aboriginal and Torres Strait Islander cultures; this has risen to 62% from 50% in 2008 when the first barometer was conducted,” she said. 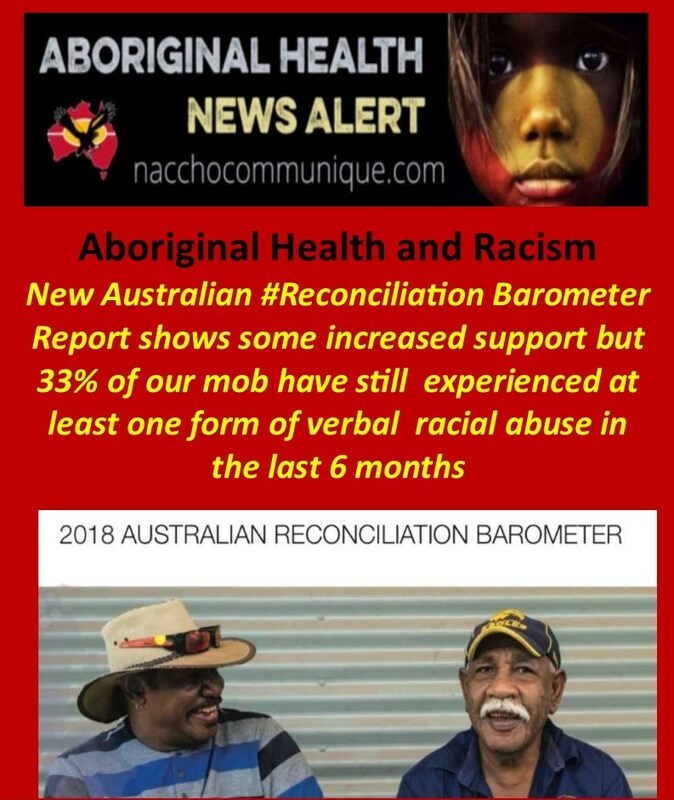 Conducted by Reconciliation Australia the Australian Reconciliation Barometer is the only survey undertaken in Australia which measures the progress of reconciliation between Aboriginal and Torres Strait Islander people and non-Indigenous Australians. Ms Mundine said she was heartened by the 2018 results which indicated that the work of Reconciliation Australia and other organisations which promoted reconciliation, the richness of Aboriginal and Torres Strait Islander culture and the need to truthfully present Australia’s history, was having a positive impact. Ms Mundine said that while it was encouraging to see support for reconciliation grow again in the past two years, “there was still plenty of room for improvement”. Ms Mundine said that there were a number of actions that should be taken to further improve the situation for Australia’s First Nations and take the next steps towards a reconciled nation. Investing in, and supporting, anti-racism campaigns and resources including maintaining strong legislative protections against racial discrimination and taking leadership to promote a zero-tolerance approach to racism and discrimination. “Our Australian Reconciliation Barometer findings show that in the six months prior to the survey, 46 percent of Aboriginal and Torres Strait Islander Australians, experienced at least one form of racial prejudice. Almost half of Aboriginal and Torres Strait Islander Australians have described experiencing racism according to the findings of Reconciliation Australia’s latest Australian Reconciliation Barometer survey. 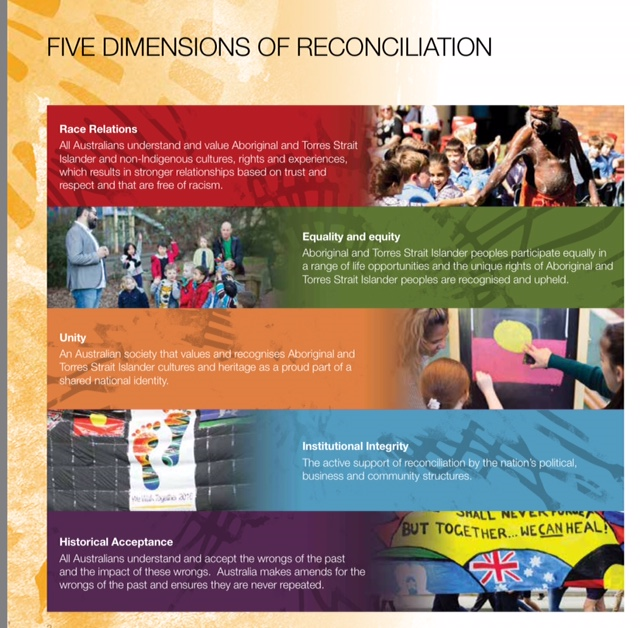 The Australian Reconciliation Barometer is a national research study conducted every two years to measure and compare attitudes and perceptions towards reconciliation in both the general Australian community, and Aboriginal and Torres Strait Islander communities.  Many Australians (57% Aboriginal and Torres Strait Islander Australians and 39% Australians in the general Australian community) agree Australia is a racist country.  Almost half (46%) Aboriginal and Torres Strait Islander Australians say they trust other Australians, but only 1 in 5 (19%) of the general Australian community think Aboriginal and Torres Strait Islander Australians trust them.  Almost all Australians (97% Aboriginal and Torres Strait Islander Australians and 89% Australians in the general community) believe the relationship is important.  Most Australians agree that Aboriginal and Torres Strait Islander cultures are important to Australia’s national identity (93% Aboriginal and Torres Strait Islander Australians and 77% Australians in the general community). “What we’re seeing since the first survey in 2008 just after the National Apology to Stolen Generations is that whilst we’ve maintained a lot of goodwill since then, we aren’t moving fast enough on issues of racism and trust. This is holding all Australians back from having positive relationships with each other,” Mr. Mohamed added. 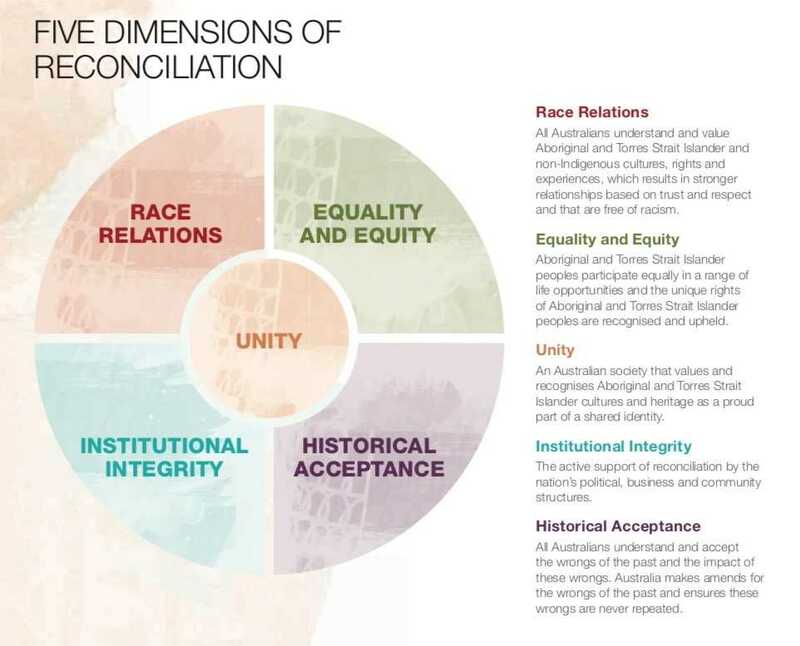 Reconciliation Australia’s biennial Australian Reconciliation Barometer has been released today, providing a snapshot of views on the relationship between First Australians and the wider Australian community. Minister for Indigenous Affairs, Nigel Scullion, said the report showed some encouraging signs but there was still a lot more work to be done. “It is very pleasing that most Australians surveyed believe reconciliation is important and that itis possible for all Australians to be united,” Minister Scullion said. “Almost everyone – 97 per cent of those surveyed – believed that Aboriginal and Torres Strait Islander cultures are important to Australia’s identity, and that more Australians in the general community now accept key facts about Australia’s past. This is extremely important going forward. 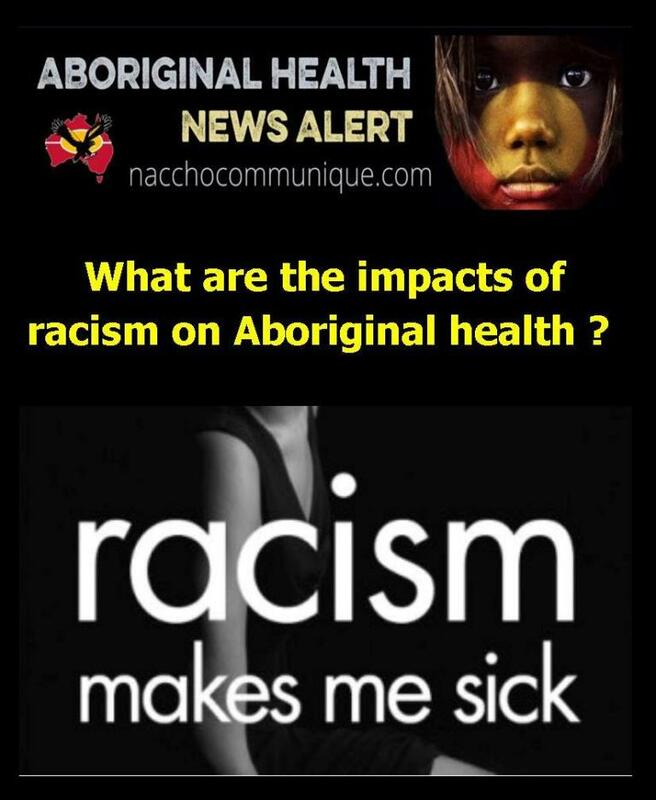 “Sadly, of those surveyed, almost half of Aboriginal and Torres Strait Islander people said theyexperienced at least one form of racial prejudice in the six months prior to the survey. “Although there are notable improvements across the last two reports, there is still more Australia can do. There is a lot of goodwill out there and with further education we can ensure our First Australians enjoy respectful relationships to the same extent as fellow Australians. “Australian businesses are leading the way through their commitments in Reconciliation Action Plans. Individuals in communities can also take a proud stand against racism.